My old workhorse boots are Scarpa T-2 (a three buckle duckbilled telly boot); my new boots are Scarpa TX-Pro boots (Scarpa’s four buckle NTN/AT boot — it has a telly bellow, but it also has the little AT binding nubs on the side of the boot). I just want to offer some praise. We have had a garbage snow year. Seriously… it’s been just terrible by most metrics. 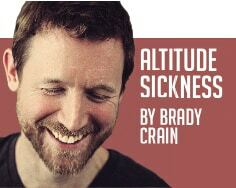 But as of the writing of this article, I have skied 84 days, and I am having an absolute blast. The reason I am having an absolute blast is directly because of the snowmakers, who have taken the gigantic basket of this lemony season, and turned it into a delicious lemon merengue pie. So hats off to you, Killington snowmaking crew! If you know any snowmakers, give them my thanks, and by all means, add your own thanks in there, too. I have worked third shift (12-hour days, 7 days per weeks at VT Castings enameling plant in 1995, and 12-hour nights 3-4 day weeks at IBM in 1998), and I hated it, though, I loved having my days free to do normal life stuff while no one else was around. The long and short of it was that I never ever slept, and probably many snowmakers don’t either. In a large part because of them, however, I am able to ski every day, which is like a magic pill, curing the worst parts of my disorganized personality. Regarding my new skis, Sir Francis Bacons, I left out two important things in last week’s article. The first is that my skis are very very stable at very high speeds, which I love. The second is that if I drop down into a telly tuck and go fast and straight on a flat, the uphill ski (the bent one) gets a wobble. I am not fond of this problem, because I know that it leads to “exploding telemarker syndrome” which looks remarkably like the old footage that played with the ABC sports “the Thrill of Victory, the Agony of Defeat” tagline as the ski jumper explodes in a shower of bone dust at the bottom of the jump. For this week, I want to talk about boots, however. My old workhorse boots are Scarpa T-2 (a three buckle duckbilled telly boot); my new boots are Scarpa TX-Pro boots (Scarpa’s four buckle NTN/AT boot — it has a telly bellow, but it also has the little AT binding nubs on the side of the boot). The new NTN boots are a revelation. The first few weeks after I purchased them from Base Camp Outfitters were pretty miserable despite the fitting work (a size smaller, I had them thermal fitted with custom footbeds, and the shells blown out at the bunion by the boot fitting team at Peak Performance). There is a little more work to be done (just a touch more stretching and a little building up to avoid heel slip), but I wanted to wait a few weeks and let them pack out a little bit before doing the final touches. The smaller size proved more difficult, but I’m still hopeful it was the right choice. These boots are just tremendous, and the walk mode is actually useful. The boots even ski well when I forget to take them out of walk mode. I eventually had to stop cranking them down so far, because they were simply uncomfortable, but they offer stupendous control even when not fully cranked down, as the traditional style metal buckles are firm and unforgiving. 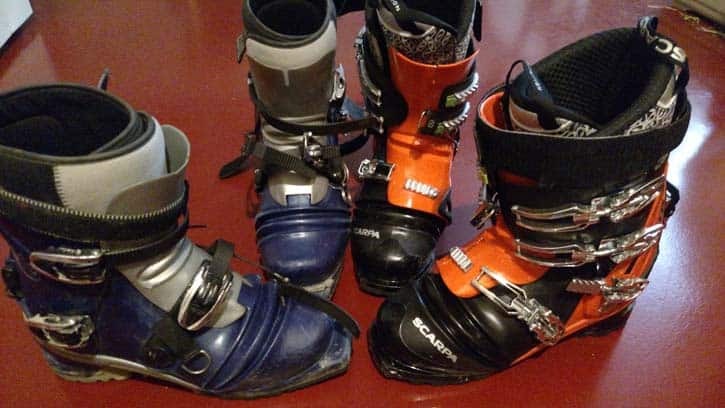 The only drawbacks are that after years of warm toes, I am back to loosening my boot every time I get on the lift so that my toes don’t go numb. Furthermore, this is a much taller boot, and though I am a tall lanky guy, I have massive calves (Arnold Schwarzenegger calls “Thousand Pound Calves”), and my T-2s sat below my calves and I could crank them down as much as I wished. With my TX-Pros if I crank them down too much at the top I get cramps, numbness, and bruised calves. This adjustment is to be expected with a boot that delivers alpine race quality fit and control. With a boot like this, there should be very little gray area between proper fit and abject misery, just one twist of buckle, one yank of strap. The thing that is clear to me is that I will never ever, not ever, ski another boot that has not been professionally fitted. It is well worth the money. Try it out and, like me, you’ll never go back.